With a few dozen happy clients under his belt, Andrew Bossola, who heads up marketing firm Oasis Creative, knows full-well the persuasive power of a timely email. He’s been using outbound email marketing to help his WooCommerce clients make more money and lock in sales for years. But frustrated that his emails weren’t personalized or targeted enough—and concerned he was missing out on opportunities to cross-sell—he turned to AutomateWoo to help fuel marketing automation for one particular client, Kats Botanicals. After creating just two email workflows—one for abandoned carts and another to win back customers—revenue shot up $8000 in just two weeks and is predicted to increase another 200% once new emails are introduced. And in the background, AutomateWoo is doing its thing, automatically firing off 1000 emails a week. 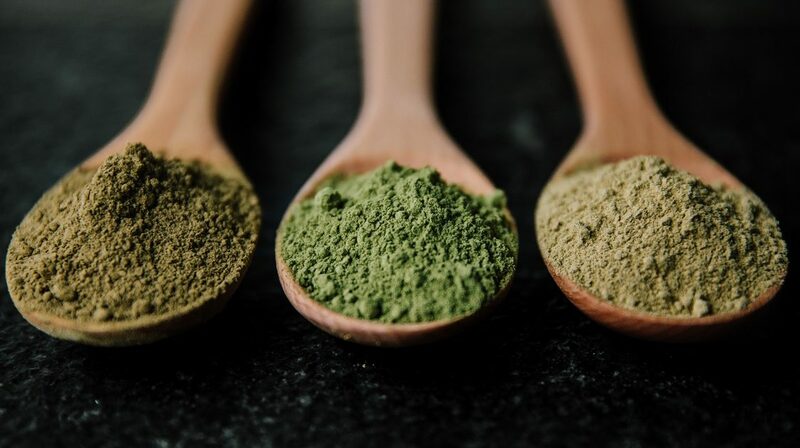 Kats Botanicals specializes in selling alternative botanicals, predominantly kratom, a powder derived from a tree native to South East Asia whose leaves contain psychoactive properties. Owner Justin sources his kratom direct from farmers in Indonesia, who cultivate, dry, and crush the leaves. When it arrives in the U.S., it undergoes rigorous laboratory testing to ensure its 100% pure, free of pathogens, and ready for customers to purchase via the Kats Botanicals website. 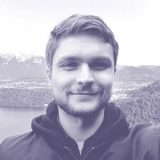 Since taking on Kats as a client, Andrew has focused his efforts around reducing cart abandonment, winning back inactive customers, and encouraging new customers to spend more. After initially working with another cart abandonment extension, Andrew was concerned his emails weren’t specific enough. He also wasn’t cross-selling, and with 100 orders a day he was missing out on 100 opportunities to push customers into buying more. What’s more, past customers who had dropped over the radar were slipping away and weren’t being enticed to come back. Andrew had his work cut out for him. So he set his sights on finding a WooCommerce extension that could solve all of these problems while at the same time improving the efficiency and automation of Kats’ emails. 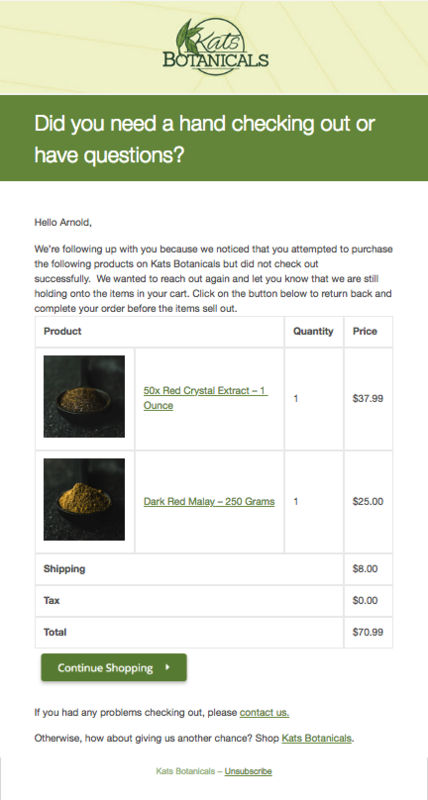 After diving into the documentation and putting together his first email—a WooCommerce cart abandonment email—it wasn’t long before a second email followed. There are now three AutomateWoo email workflows running on the Kats Botanicals website: a cart abandonment email that sends every 12 and 24 hours, a win back email, and an email list sign-up. With traffic upwards of 6000-8000 visitors a day and 100 orders daily, AutomateWoo has seamlessly blended into the day-to-day running of the store, firing off around 1000 emails a week to customers who have left items in their cart, and bringing back inactive customers to the Kats Botanicals website. “Of the few conversions we have with AutomateWoo, they go into the five-figure range each month. So the value is high,” Andrew says. Andrew expects these numbers will increase once new email workflows are introduced in coming weeks. The biggest challenge, he admits, has been writing good copy for workflows. But after recently hiring a copywriter, he plans to add seven new emails, including a welcome series, upsells and cross-sells, pre-delivery information, and educational content based on purchases. “With AutomateWoo I can pitch someone CBD gummies if they bought CBD oil, for example. The cross-selling functionality is endless but the extension is even more powerful than that. I’m just scratching the surface,” Andrew says. After implementing the cart abandonment and win back emails, AutomateWoo showed immediate results, helping to pull in $8000 in additional revenue in just two weeks. Now that the emails have been in place for a little while, revenue has evened out to an additional $3000 a week. He has big plans for further increasing Kats’ revenue using AutomateWoo to increase sales with WooCommerce abandoned cart emails and other workflows. “We rank number one for a lot of big terms in our market. We get about 90,000 uniques a month. I’m hoping to create about 10 new email strategies and potentially increase revenue by $80,000 to $160,000 a month,” he explains. With relatively little effort, Andrew is thrilled with what he’s been able to achieve with AutomateWoo so far, but Justin even more so. “I send him the reports from AutomateWoo. He loves to see how much additional income AutomateWoo has helped pull in. Yes, it makes me look like a genius!” Andrew says. He now plans to pitch AutomateWoo to 4-5 other clients he believes could also benefit from the extension’s ability to automate email marketing and pull in additional revenue using WooCommerce abandoned cart emails.